I’ve been asked for this recipe a couple of times lately….I thought the recipe was already on my blog, but apparently I’d posted it on an old blog that I don’t use anymore. So here it is! This absolutely delicious drink makes frequent appearances at our Autumn dinners. I usually quadruple the recipe and heat the cider and vodka in a crockpot. Its got just the right amount of booze to give you that warm glow, but not so much booze that it gets to your head. Now, don’t go and screw this drink up by using store-bought whipped topping. I’m so serious. Make your own whipped cream.. it’s not hard to make… and the little bit of rum…. Oh! So good. Trust me. Combine softened butter, brown sugar, nutmeg, cinnamon, and cloves. Whip until butter becomes creamy and the ingredients are fully incorporated. Chill. In a separate bowl combine rum and whipping cream, whisk until fluffy; add powdered sugar. In a pretty footed coffee glass, place a spoonful of spiced butter. Ladle the hot cider to fill the glass. Garnish with a dollop of rum-whipped topping. Serve warm. Last weekend I hosted my cousin’s bridal shower. Finally. I’ve been plotting this party since she got engaged two years ago. Two years?! I’m not the patient one, obviously. Brian was really relieved to have the party over as well. I’ve been buying and storing party items in our basement for over a year now. The day after the party we cleaned the basement and packed away all the party decorations. Who knew there was a floor in the basement?! Brian. He kept reminding me that there was, in fact, a floor in the basement, but it hadn’t been spotted in several months. Since I had leftovers, I decided to try to use everything up at Family Dinner Night. 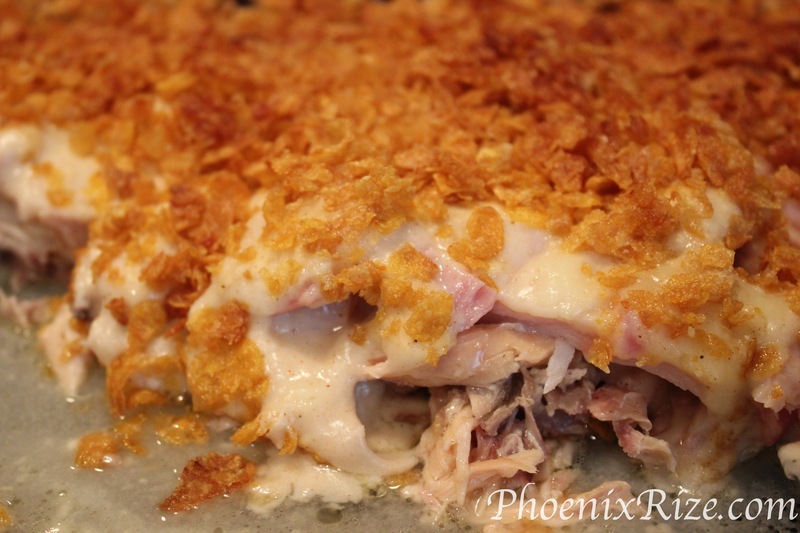 Chicken Cordon Bleu Casserole would use up the last of the sliced turkey, ham and swiss cheese from the Dollar Roll Sandwiches. Normally I only use ham in the casserole, but since I had the turkey, I went a head and used it up. No complaints from the family, but it didn’t make a big difference, so I wouldn’t bother doing it again. I was just using up what I had. I was also able to use up the rest of the lettuce in another salad (because you can’t buy 2 romaine hearts at CostCo, you have to buy SIX) and I chopped up the remaining chocolate clusters and tossed them into some homemade ice cream. The very last of the leftovers went into lunches for the rest of the week. Yay! All in all, the party was a hit, but I am happy to have it safely and happily behind me and the leftovers out of my fridge no longer tempting me. Preheat oven to 350° Spray a 9×13 casserole pan with nonstick spray. Layer the shredded chicken in the bottom of the pan, followed by the ham. Finally, layer the swiss cheese on top. In a medium saucepan, melt the butter over medium heat. Whisk in the Cup4Cup flour to form a rue. Allow rue to begin to bubble, but not brown. Slowly add the milk until smooth. Continue whisking as the sauce bubbles and thickens. Remove from the heat and add the lemon juice, mustard and spices. Pour the finished sauce over the base layer. Melt the butter in a small bowl then add the crushed cornflakes. Toss the cornflakes in the butter until completely coated. Sprinkle over the top of the dish and bake for 45 minutes. 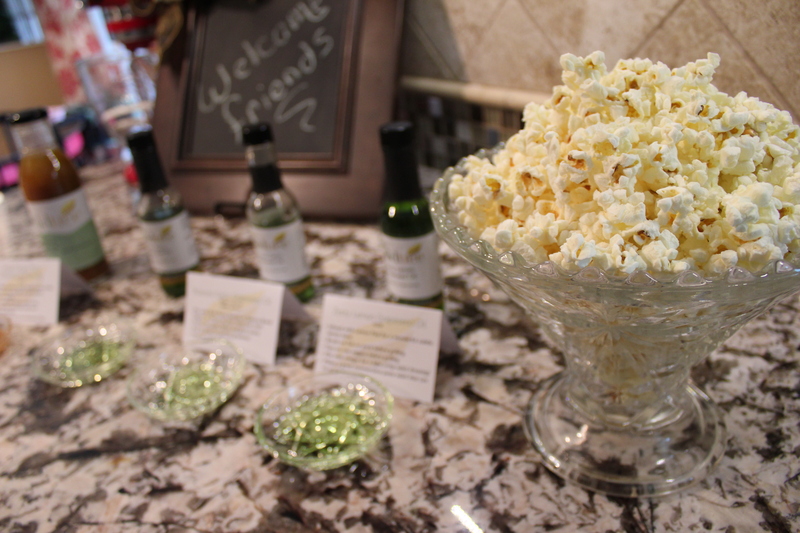 Brian and I hosted our first Gluten Free Living: Dinner & Discovery event last night. It was even better than I’d hoped! We had six guests, old friends and new friends, some totally new to the lifestyle and some who have been living it for a while now. We spent a great evening cooking, eating, chatting and learning. It is so nice to be able to share the excitement and frustration of living Gluten Free with others who are on the same path. We all had tips and questions and ideas to share…. it was wonderful! One of the things we want to do with these Dinner & Discovery parties is showcase the products and tools that we’ve found to be really useful for cooking Gluten Free. Remember, we’re not getting most of our food out of a box anymore, we’re making it. We also want to share the recipes that we KNOW work. When we first went Gluten Free, Brian and I ruined so many recipes because we either didn’t have the right tools (ever try putting one avocado in the full sized food processor?) or we didn’t understand the new foods (hello, coconut flour) that we were working with. Once the brownies went into the oven, I grabbed the roasted spaghetti squash and demonstrated the way they should look and feel when they are done. I also showed everyone how easy it was to go from squash to spaghetti…. something I hadn’t quite believed would be so easy when I first started making spaghetti squash. With the demonstrations done, we headed to the dinner table and dug in. Conversations wandered from food to travel and families and back again…. it was wonderful. Good friends and good food…. good for the body and good for the soul. Cut avocado in half, peel and add to mini food processor. Process until VERY smooth. 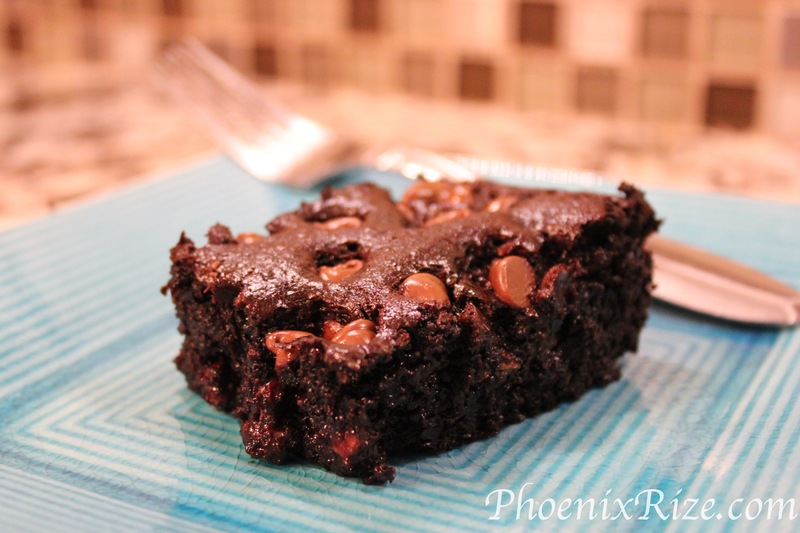 Melt the dark chocolate and coconut oil together in the microwave or over a double boiler. In a stand mixer, combine avocado and all remaining ingredients (except chocolate chips) and whip until very fluffy (3-5 minutes). Spread batter into greased 8×8 or 9×9 and sprinkle the top with chocolate chips. Bake for 30 – 35 minutes. Remove when toothpick comes out clean. Next, use a small cookie scoop* to scoop the chocolate into 12 balls. Roll the balls between the palms of your hand to create a smooth surface. 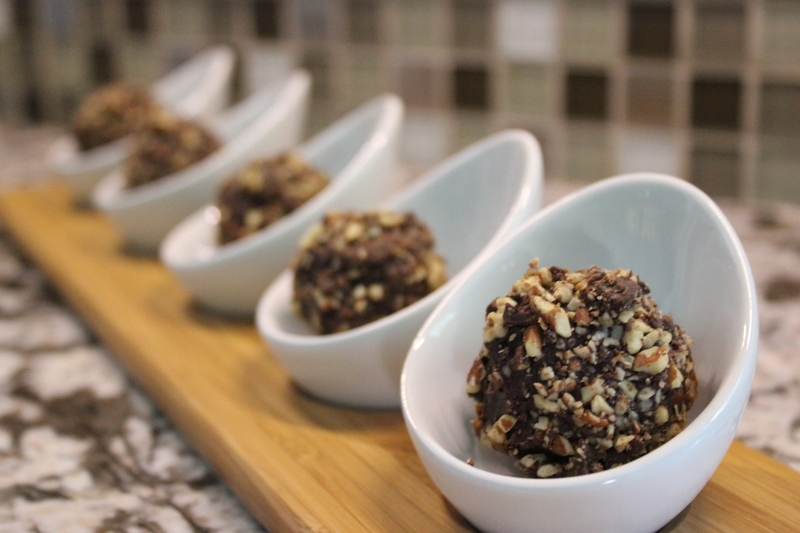 Roll each truffle in the chopped pecan and chocolate chips mixture until evenly coated. Serve at room temperature, but store in the fridge. Brian and I held our first Wildtree parties this weekend. Wildtree suggests that you hold two launch parties, back to back, to give all your friends and family a chance to join in the fun. 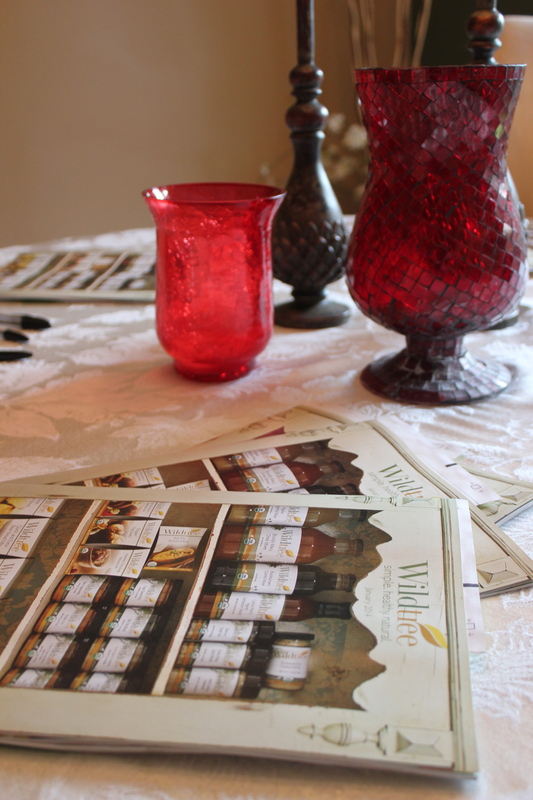 It is also a great chance to try out all the products in the hostess samples and experience a Wildtree party from the hostesses’ perspective. First off, we discovered that we like pretty darn much everything from Wildtree. There had been a couple of the samples in the hostess packs that I wasn’t too interested in…. then I got to try them…. Oh, Yum! Like the Dill Dip…. I’m okay with dill dip… I just don’t usually buy/use dip, so I wasn’t expecting to get excited about it. Wow! Everybody at the party went wild for the Dill Dip. I was more excited about using the leftover dip than using it as a “dip.” I used some of the leftover samples from the first party to experiment with a few new recipes. Crunchy Dill Chicken Bites Recipe… coming soon! I fell in LOVE with the Hearty Spaghetti Sauce Blend. Holy cats! Just add a can of crushed tomatoes and let simmer…. SO good! Good-Bye spaghetti sauce in a jar! Brian really liked the Taco Seasoning. We’re kinda nacho fanatics…. so we’ll be adding that to our pantry too! I wasn’t crazy about the Heavenly Chocolate Mousse at first… the directions say to let it sit for a couple of hours before serving… so I made it the day before and let it sit….but it still tasted bitter to me. I almost didn’t serve it at the second party, but I tried it once more and “whew” it was good! I’m not sure if it was something I did, or if it just needed more time for the sugars and chocolate to “meld.” I might have developed a little bit of an addiction for the Chocolate Mousse and Annie’s Organics GF Cocoa and Vanilla Bunnies! We are so thankful to all our friends and family that came to our parties to support our new endeavor. Spending time with friends and family (and meeting new friends) was a huge portion of the reason we joined Wildtree. Dinner parties! What better excuse to get together and hang out? Every Tuesday night Brian and I host Family Dinner Night at our house. We could have anywhere from 7 to 15 people around the table. In-laws, Out-laws, Halfs, Steps, and sometimes a random friend shows up…. we take the “Family” part fairly loosely…. Blood relation isn’t really required. Grandpa just turned 90 and since Grandma passed he has been doing much of his own cooking… he asked for one of my crock-pots (I did have seven…. so I could spare one. )… He seems to be enjoying his crockpot concoctions, but it does make me feel good to make a full, home cooked meal for him every week. It is also nice to have the whole family together fairly often. I’ve never understood why some families only get together on holidays. I mean, I get it, if you live far away or something…. but if you live in the same general area? What is the big damn deal about getting together on a certain calendar date? I’m reasonably available most of the year…. if you want to see me…. call. Have you noticed how miserable those winter holidays are because you are “stuck” attending events with relatives that if they actually gave a damn, could see you most anytime of the year? It’s not special if it’s an obligation, people. I just don’t get it… If family is important to you… then you need to make the effort to see them. Anyway…. 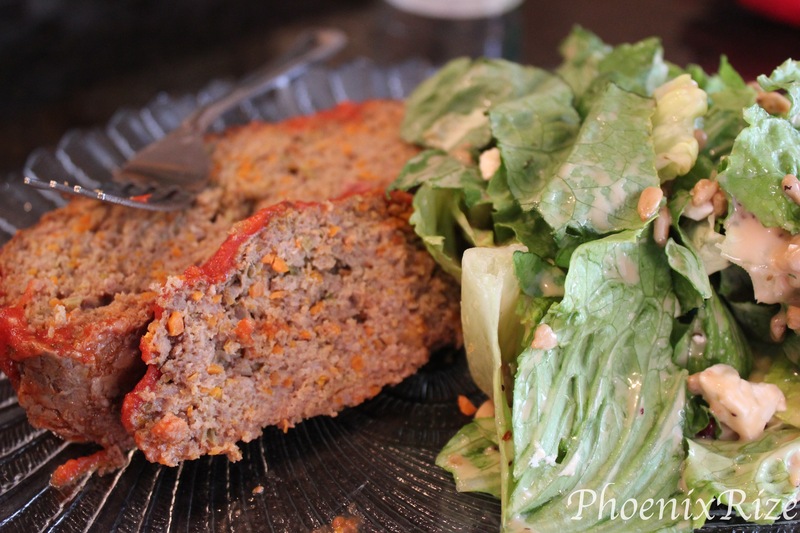 this is the meatloaf I made for Family Dinner Night this week. It’s gluten-free (I don’t know why people add breadcrumbs anyway,) and filled with yummy veggies. If Mom got to choose, we’d never have meatloaf, but ever-so-often I like to make a “manly” meal. I cheated and didn’t make mashed potatoes…. since Brian and I are trying to stay low-carb I try to keep FDN’s low-carb and gluten-free too. I did make (GF) Corn Pudding though…. so they’ll get carbs…. And everyone’s favorite Autumn Salad. Dump the mixture into a 13×9 pan and shape into a loaf. Bake at 375º for 90 minutes. Every good menu has a theme, right? The theme here? Avocado! Every dessert was made with avocado. 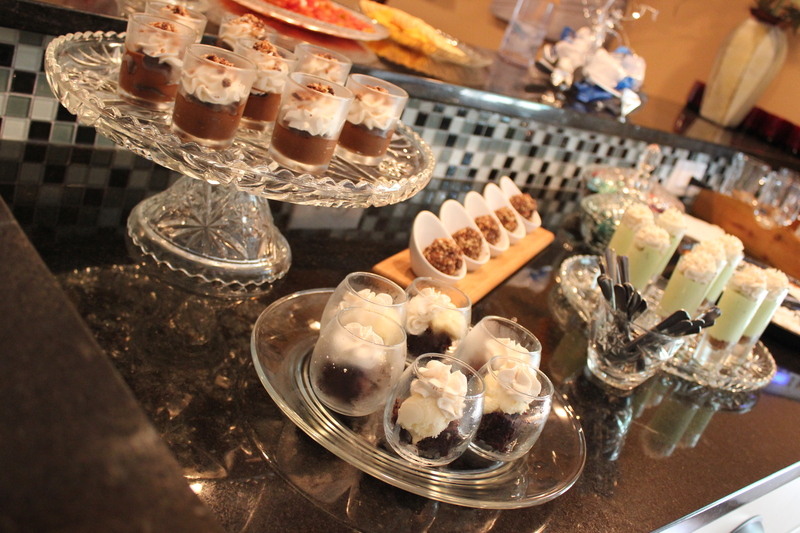 We didn’t say a word until everyone had polished off their desserts. I’ve got some pretty picky eaters in my group and no one seemed to notice our secret ingredient. 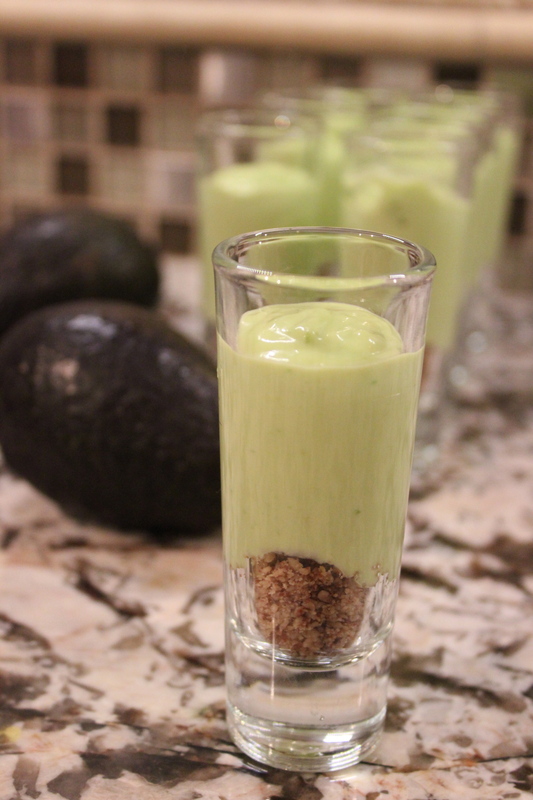 I have to admit, I was impressed with these Avocado Lime Cheesecakes cups. The avocado is pretty overpowered by the lime…. I think you could serve this and no one would ever know. I wanted to keep all the desserts gluten-free. Since I was serving these in cups, I didn’t bother with a “crust”. I just ground come pecans and put them in the bottom of the glass. With each spoonful you got a little bit of pecan..yum! In a mini food processor*, chop 1/2 cup pecans. Spoon pecans into glasses. Heat cream in a small saucepan until warmed, but not boiling. Add sugar and stir until sugar dissolves. Remove from heat and set aside to cool. In the mini food processor , and add the avocado and cream cheese. Pulse to combine. Add lime juice and a pinch of salt and pulse until smooth. Add cooled cream mixture and pulse just to combine. Using an icing bag or Zip-Loc, pipe avocado/cream cheese mixture into the glasses. Place in freezer for several hours or overnight. Garnish with lime zest or whipped cream if you like, and allow to thaw a bit before serving. * If you want to make a whole pie, just double this recipe or check out the original recipe HERE.